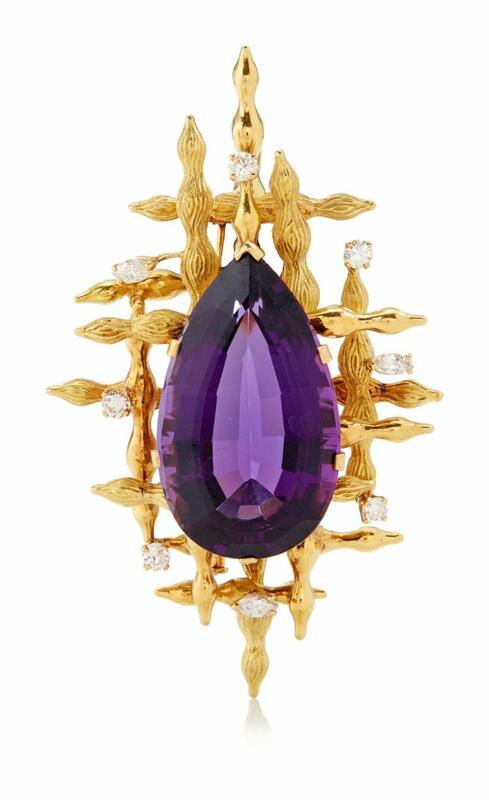 Description: Set to the centre with a pear-shaped amethyst, upon a textured lattice set with brilliant-cut and marquise-shaped diamonds, French assay and maker's mark. Condition: Pin and reverse of brooch stamped with French assay mark for 18 carat gold, pin stamped with maker's mark JAG with squirrel. Amethyst measures approximately 36 x 21.8 x 14.36mm, calculated to weigh 53.76 carats. Mid purple, transparent, appears clean to the naked eye and with some very light surface scratches. Diamonds bright and lively, estimated total diamond weight approximately 1.00-1.50 carats, estimated colour H-I, estimated clarity VS on average, as graded within the limitations of the mount. Light scratches to mount commensurate with normal wear, pin fitting closes securely with sliding safety catch. Dimensions approximately 80 x 48mm, gross weight approximately 39 grams. In good condition. Please note Condition 11 of the Conditions of Business for Buyers (Online Only) is not applicable to this lot. For further information please contact the department on +44 (0)207 293 6409.